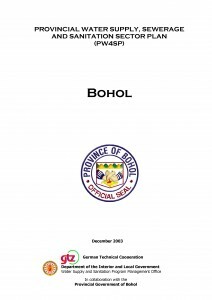 The Provincial Water Supply, Sewerage and Sanitation Sector Plan (PW4SP) for the Province of Bohol, prepared with technical assistance from the Federal Government of Germany through the GTZ Water Program, includes a Long-Term Development Plan (2011-2015) and a Medium-Term Investment Plan (2004-2010) to achieve the provincial targets of the water supply, sewerage and sanitation sectors. The PW4SP has been prepared at the municipal level covering all sub-sectors for each of the municipalities of the province. The PW4SP consists of 11 chapters that include a description of the planning approach for the sector’s development, the provincial profile on current sector conditions and geographical features, socio-economic conditions, demographic trends, health status and environmental conditions. Several chapters also describe existing sector conditions in physical, managerial and financial aspects; existing water supply and sanitation facilities by service level and service coverage; sector institutions, community development, gender and training, as well as monitoring systems; financial performances covering cost recovery and affordability; and new fiscal policies as bases and references for development planning. Also includes an analysis of the possibility of water source development for the water supply component. The long-term Development Plan and the medium-term Investment Plan are both for physical and sector management requirements. Also presents financial arrangements based on identified sources of funds. 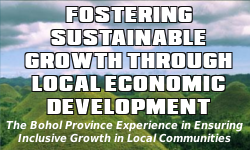 Available in PDF and hard copy at the Provincial Planning and Development Office (PPDO).